I love this Creamy New England Style Clam Chowder recipe. It’s also known as Boston Clam Chowder. Growing up in a Russian household, we never ate creamy clam chowder. We never ate any type of seafood chowder. My mum won’t even eat shrimp, as she call them ocean worms! She doesn’t know what she’s missing! Traditionally American Clam Chowder originated in the Eastern United States. Common recipes include Manhattan Clam Chowder, Long Island, Rhode Island Clam Chowder, with as many recipe variations as there are names. The first time I ever ate Clam Chowder was from a Campbell’s Soup can, and I thought the clam flavor was delicious! It tasted different from the fish soup recipes I tried before, and I love creamy soups. So imagine when I tried real Clam Chowder made from scratch, I was hooked! I remember trying Creamy Clam Chowder in San Fransisco at Pier 39, served in a sour dough bread bowl. Once you’ve tried real clam chowder, there is no going back to canned soup! Thank goodness this recipe is easy to make. The hardest part of this recipe is finding fresh clams! I buy frozen clams and they work great in this recipe, just like fresh clams. Fresh seafood is always best to use, but not always available, and can be expensive. Not everyone lives near the ocean where they can dig for fresh clams. I always try to use fresh or frozen clams instead of canned. If you are using fresh clams from the beach, remember to wash and scrub them before making the clam broth. But, frozen clams are a thing! So next time you see them in the frozen aisle in the supermarket, buy them to make this recipe. What Type of Clams to use for Clam Chowder? Clam Chowder isn’t that common in Australia, Campbell’s Soup doesn’t sell it here. We don’t have anywhere near the varieties of fresh clams that are available in North America, and they aren’t as popular here. We do have Pipis, Vongole, Razor Clams and Cockles, which are all shellfish with a double hinged shell. These are generically called clams. Don’t get hung up on the right variety of clams to use, any clams will work great in this recipe. The wine is optional, but I love what it adds to the recipe. 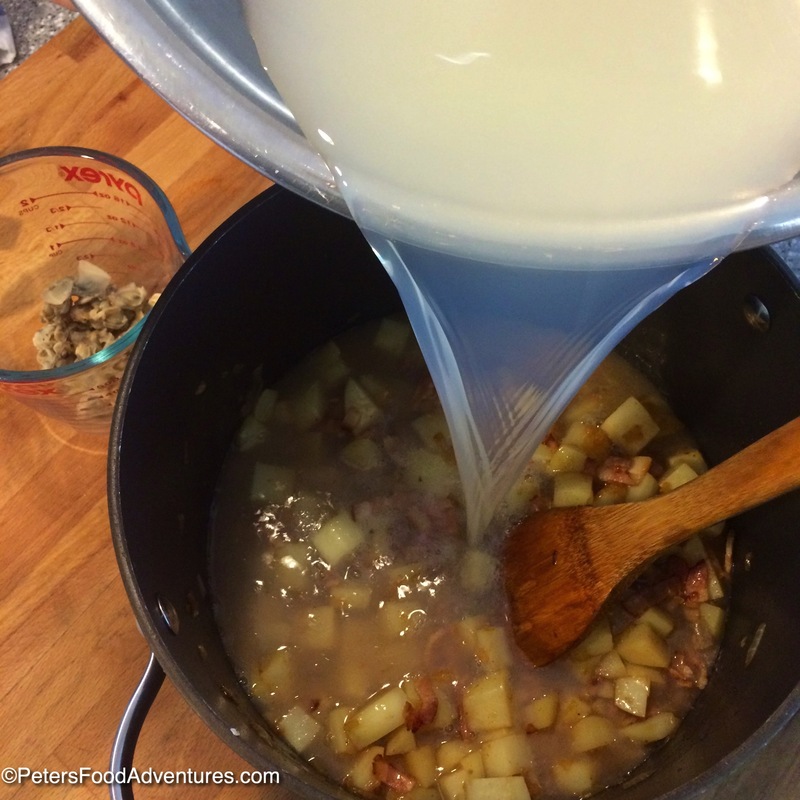 Traditional Salt Pork found in New England Clam Chowder recipes is impossible to find around the world. I did what everyone else does, substituted it with bacon (another salty pork product). I love this creamy clam chowder recipe. It’s creamy broth, eaten with a piece of crusty sourdough bread is perfect for dinner tonight. Bon Appetit! Приятного аппетита! Creamy New England Clam Chowder. 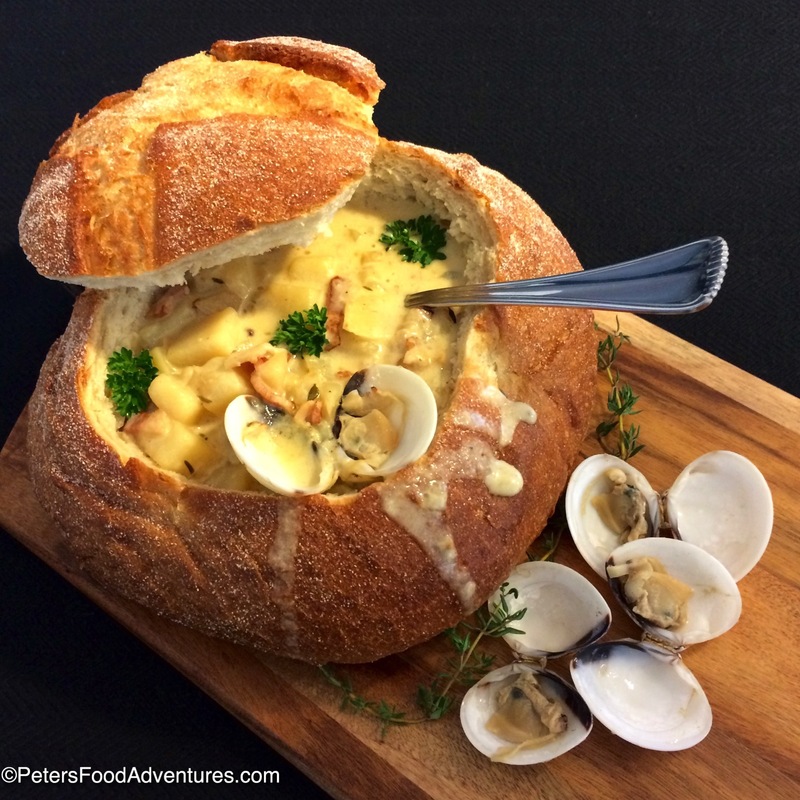 A real clam chowder recipe, that's easy to make. A thick and creamy soup with potato, bacon and wine. An easy dinner favorite! 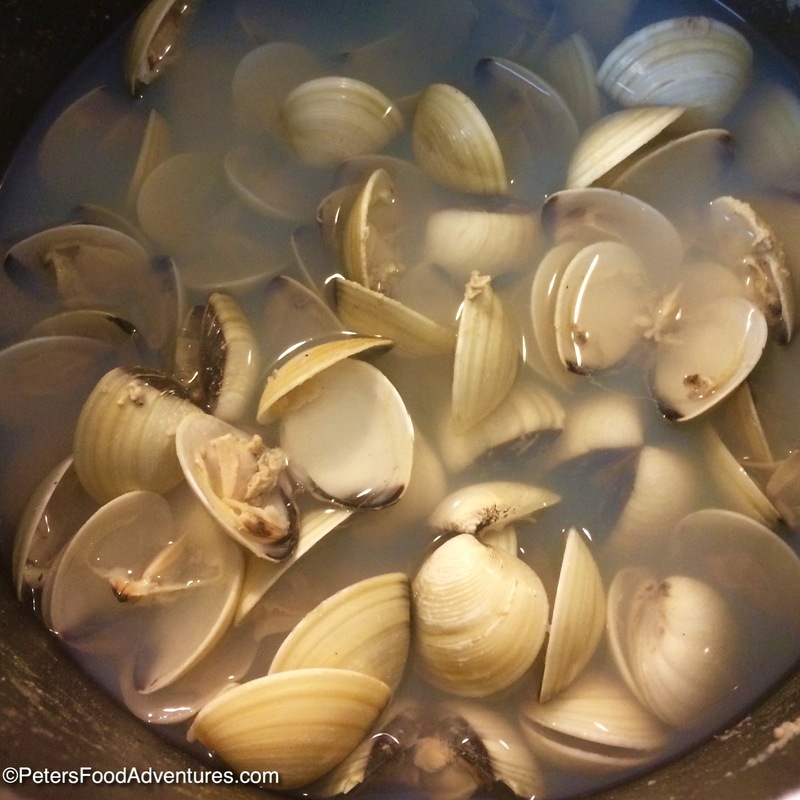 Place the clams in a large stockpot with 4 cups of water over medium high heat. Cover and cook the clams for about 10-15 minutes until they have opened. If a clam has not opened, then throw it away. Strain the clams through a colander lined with a cheesecloth. Set aside the broth. Remove the clam meat from the shells and discard the shells. In a stockpot, fry the bacon until it starts to brown. Add the onions and garlic and continue to fry for another 10 minutes. Add the potatoes and wine to the bacon mixture and cook for a few minutes until the wine has mostly evaporated. 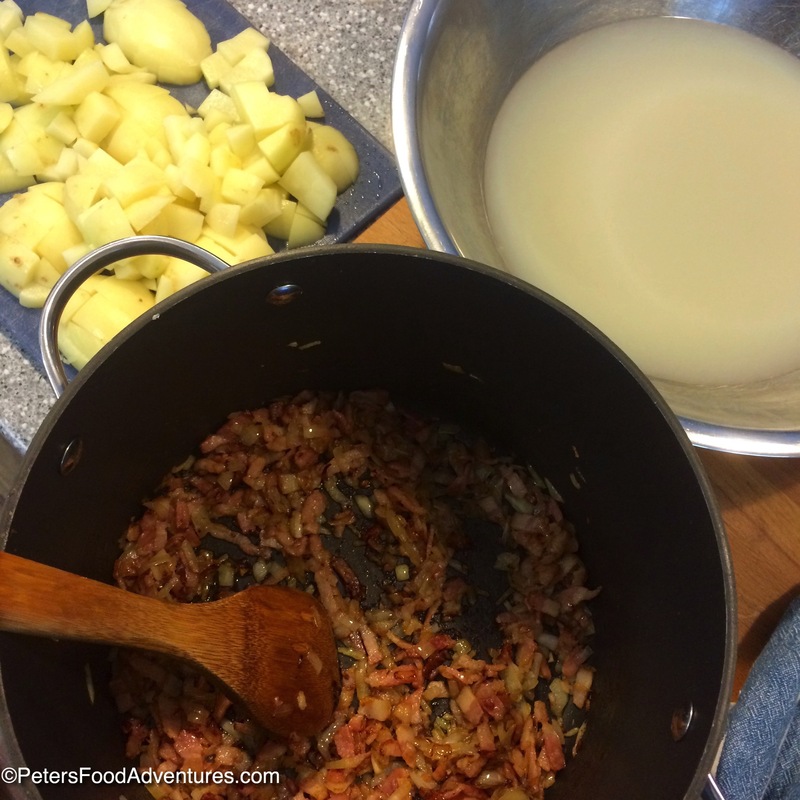 Add the clam broth, thyme and bay leaf to the pot. Bring to a boil and reduce to a simmer for about 20 minutes. While the potatoes are cooking, Dice the cooked clams into small pieces. When the potatoes are tender and cooked, add whipping cream and chopped clams. Bring to a simmer. Make a cornstarch slurry by mixing 2 tablespoons each of water and cornstarch. Pour into the clam chowder and continue to cook until the chowder thickens. Taste. Season with salt and white pepper to taste. Before serving, remove the bay leaf and garnish with chopped parsley. Great pictures! I like the bread bowl idea. Thanks, and the best part…. No dishes!!! Thanks, one of my favourites! And tastes amazing too! I had a hard time sourcing clams, but finally found some frozen ones, they worked a treat! ???? Oh My, Peter! Your clicks speak louder than words…bet the taste just the same! Gorgeous! !